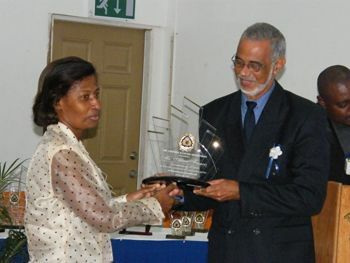 Addressing an awards ceremony last week Friday, at the Aquatic club, in recognition of persons who made significant contribution to the development of the department over the years, Grenville John, Comptroller of the CED, disclosed that last year they were able to collect $11 million dollars more than their estimated amount. He said this was against the backdrop of premises that reflect poorly on the image of the organization. John stated that he believes this issue can negatively affect the departmentâs productivity. The comptroller noted that work on the new administrative building began in earnest in 2007 but was suspended in December of 2008. He believes that âthe creation of a modern, progressive and productive environment will engender the support and productivity of staffâ. Mentioning some of their achievements thus far, such as the implementation of the declaration module and role of the cargo module, John said that they have âsimplified procedures, facilitate legitimate trade and reduce cost to the business communityâ. He said, in their quest to further develop the department, their aim is to implement a number of systems, including development of web services, implementation of asycuda ++ and a code of conduct for customs officials.